2Prof. Dr., Dokuz Eylül Üniversitesi Tıp Fakültesi, Göz Hastalıkları AD, İzmir, Türkiye Purpose: To evaluate the results of intravitreal injection of anti-vascular endothelial growth factor (anti-VEGF) in patients with myopic choroidal neovascularization (mCNV). 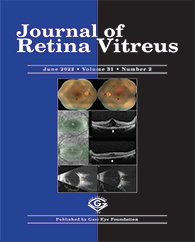 Material-Methods: Files of the patiens with mCNV who received intravitreal anti-VEGF injections between January 2010 and 2017 were reviewed retrospectively. Records of 11 eyes of 10 patients were evaluated. Results: Seven patients were female (70%) and three male (30%). Mean age of the subjects was 63.9±15.0 years (27-79 years). Mean follow-up time was 20.1±15.7 months (6-53 month) and mean axial lenght of the eyes was 28.1±1.4 mm (26.57-31 mm). Localization of mCNV was subfoveal in 8 eyes (72.7%), extrafoveal in two eyes (18.1%) and juxtafoveal in one eye (9%). Mean best-corrected visual acuity (BCVA) was 0.5±0.32 and mean central macular thickness (CMT) was 375.1±105.0 μ (Range: 250-500 μ) at the baseline. Mean number of anti-VEGF injection was 4.6±5.8 (Range:1-19 injection). Four eyes received only ranibizumab injections, four eyes only afl ibercept injection and 3 eyes ranibizumab and subsequent afl ibercept injections. Mean BCVA was 0.40±0.25 and mean CMT was 347.3±110.4 μ (Range: 218-530 μ) at the last visit. There was no statistical difference between baseline and fi nal BCVA and CMT (p >0.05). The BCVA improved more than one line in 3 eyes, worsened more than one line in four eyes, and was unchanged in four eyes.